I noticed the tiniest, most joyful little detail in my second viewing of Faces Places (or its lovelier French title, Visages Villages), Agnes Varda and JR’s humane, sweetly digressive documentary about meeting and photographing working class folk in France’s small towns. 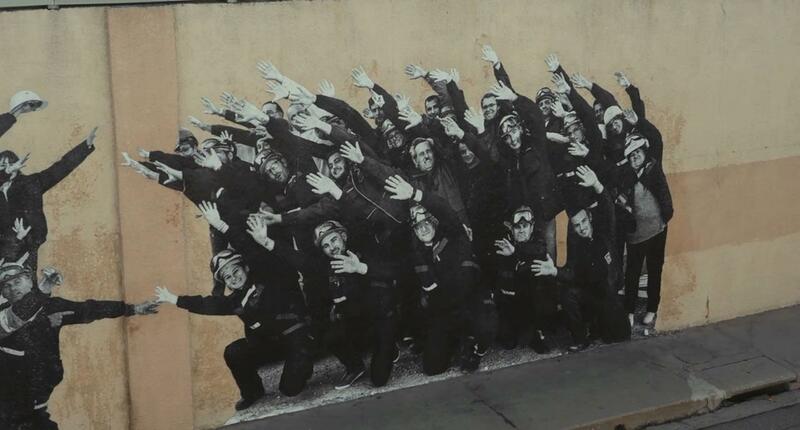 JR, a young visual artist whose calling card is pasting large photographic prints across the fronts of trains, tankers, and large buildings, has set up a scaffold to put up his latest piece of work. A friendly police officer has crossed the street to inform him politely but matter-of-factly that he will need a permit to erect any future scaffolding in this town. JR smiles and shows he understands and then starts joking and conversing with this civil servant. A moment later, Agnes Varda (legendary French director and the thoughtful nonagenarian co-director of this effervescently poetic film) arrives to suggest JR head to a nearby café to meet a beautiful barista who they may want to photograph. In the next beat, JR is in the café meeting the barista. And the officer is there with him! This stranger, who basically just came to check his paper work, is now there right beside JR just merrily tagging along on the errand. This most minute of moments is Faces Places’ soul in miniature, and I also think it points to perhaps the most vital skill a nonfiction filmmaker can possess. One of the most invaluable and often invisible talents that the greatest documentarians have is the ability to draw people into their orbit. You must make people want to be around you and talk to you. A great documentary filmmaker knows how to engage, even with the most shy and taciturn of subjects, to make them feel comfortable and open and ready to bear themselves. Expressing oneself for a camera can be an awkward, uncomfortably intimate thing even for a seasoned actor, and the magic trick of the most brilliant documentaries is to guide a person through that difficult process when they, in all likelihood, are not professional performers. 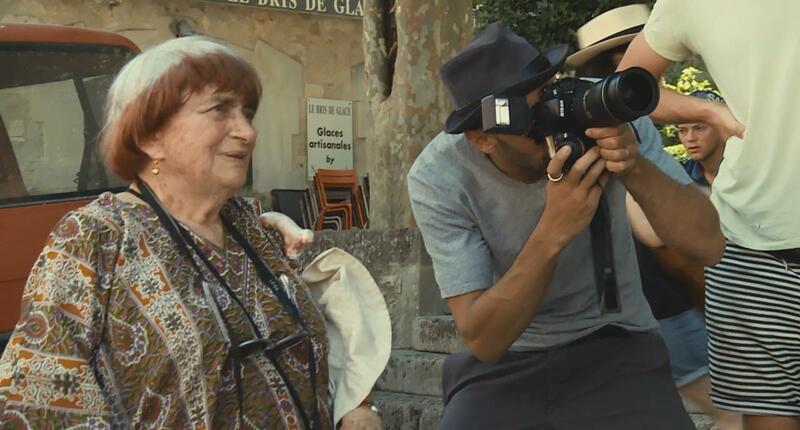 Faces Places finds Agnes Varda and JR to be masters of connecting with the people they interview and you leave each exchange feeling that they have coaxed something deep and true out of their subjects. What makes this one of the most superlative documentaries ever made is how even the most humbly withdrawn subjects they find end their encounter smiling, engaged, and eager to reveal more of themselves. Faces Places is quite possibly the most unabashedly humanistic documentary I have ever seen, and it attains that power because its creators seem to genuinely love people. 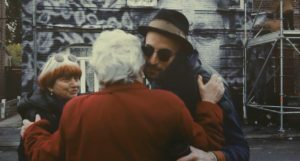 At the end of a long year, where it felt like a whole lot of human beings distrusted one another as a rule, Faces Places is a reminder that it is in our nature to reach out to one another and need one another. It is a love letter to human beings, working class ones in particular, that positively glows with empathy, curiosity, and affection for humankind. 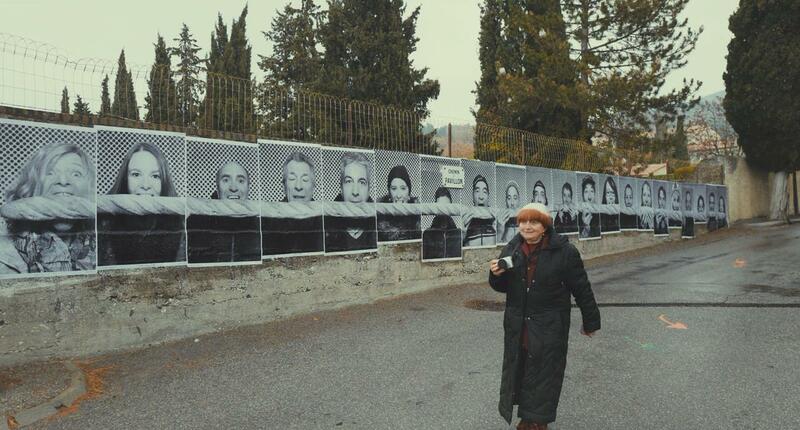 The first thing to know about Faces Places is that it is an Agnes Varda film. If you are not aware of the 90-year old filmmaker’s past work, take comfort in the fact that this would-be cinephile has not caught up to a single film in her large, influential body of work until now. It is an omission I mean to remedy as soon as I can. For now, it is just important to know that the prolific Varda was a pioneer of the French New Wave, the stylish, energetic, and frequently anarchic film movement led by directors like Jean Luc Godard and Francois Truffaut, which tore down many of the boundaries of classical filmmaking and had a massive impact on a generation of modern filmmakers (Quentin Tarantino and Martin Scorsese among them), who would take inspiration from its innovative, brazen example. Agnes Varda comes from this French pack of rebels, though her rebellious streak is more subtle and contemplative. She is a petite woman with hair that is half-auburn and half white, and she carries herself with a gracious, unfussy candor. At ninety years of age, where many a director might lose their cinematic appetite, Varda is motioning for a dessert menu. In Faces Places, she strikes up an artistic partnership with a 33-year old, sunglass-clad French photographer named JR. 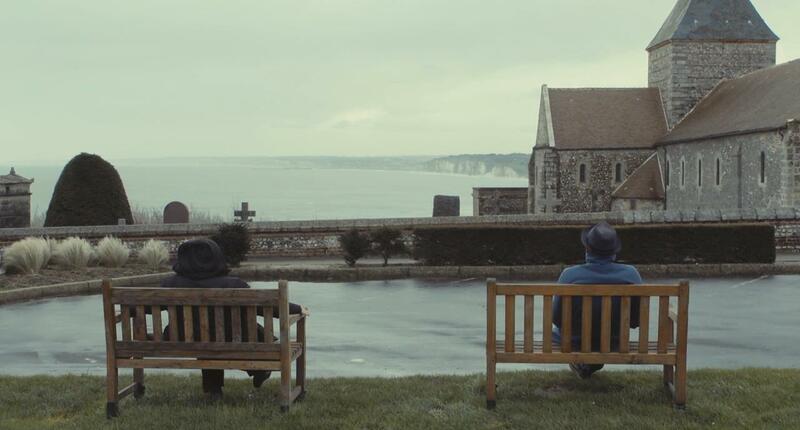 The two of them take a fast liking to one another and decide to head out on a loosely structured road trip through the many bucolic villages of rural France. They know each others’ talents (she a filmmaker and he a visual artist) and admire each others’ work. They have an idea that they will go out with a film camera, meet people, shoot their pictures, and the rest, in that oh so nebulous French way, will reveal itself to them along the way. 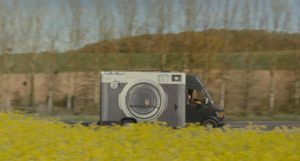 The two new friends set out on their odyssey in JR’s mobile photography studio, a modest vehicle with a camera printed on the side and a small lab in the back. 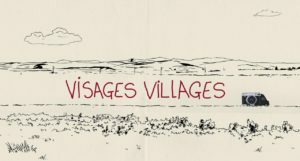 The idea is to head away from Paris and into the villages of the French countryside, where the two mutually admiring artists will mingle with the local populace and practice their respective arts. 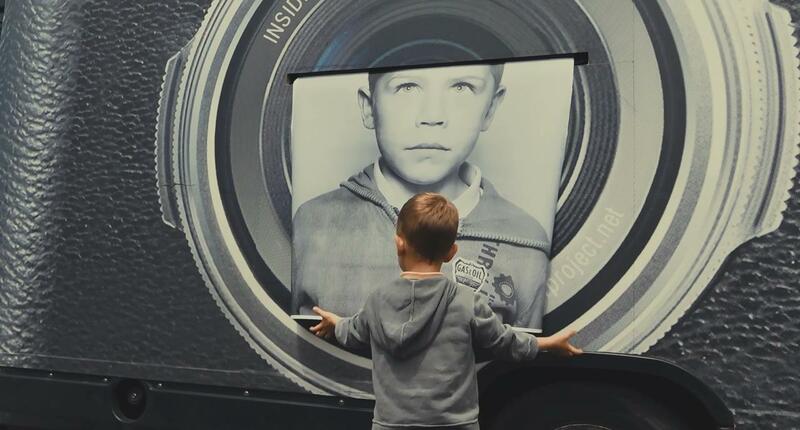 This involves introducing themselves to people, learning their stories, and using JR’s gift for grand-scale photography to pay tribute to them. 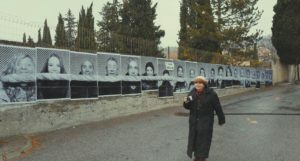 In their first encounter, JR blows up photographs of villagers with a baguette between their teeth and stitches them together across a town fence to create what looks like an entire village feasting together on the same long loaf of bread. They travel to a salt processing factory and plaster images of every worker reaching out to one another across a spillway. And, in a tremendously moving scene, they meet a miner’s widow who is the last resident left on a block of abandoned, dilapidated houses, and emblazon her image twenty feet high across the façade of her home. Faces Places is a beautiful, lyrical travelogue of France, surely the finest documentary ever made about photography, and also a sweet, heartfelt ode to modest, hardworking people. It is also about Agnes Varda and JR and their relationship as partners, as cinema-lovers and as friends. It is the story of an older artist who is drawing closer to the end of her life and her meditations on death, art, and legacy. And it is very much about how her dear friendship with this kindly, hip young man colors those ruminations and reflections. 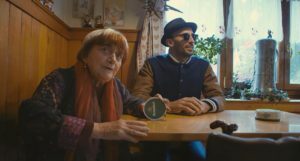 If one line evokes the soul of Faces Places, as well as that of the curious, poetic Varda herself, it is one that comes early in Varda and JR’s discussions about what the film will be. Varda is not concerned about setting out on the road with only the most tenuous of premises. “Chance has always been my best assistant,” she tells JR. Varda began her career as a photographer, and this notion, of never knowing what one will find but being ready for whatever it is, is a vital part of photography. You cannot always control what images will enter the frame, but you know they will come and you wait for them in anticipation. Faces Places is a masterpiece made on the fly. It attains much of its beauty via its invigoratingly flighty spirit, flitting from subject to subject and spinning merrily into sublime digressions. At one point, the film wanders off into a meadow for ten minutes to muse about two opposing schools of thought on goat farming. The genius of the film is that it leads with a spirit of blithely restless wanderlust, yet the end result feels soulfully cohesive. Varda is a brilliant editor and arranger of her own work, and having perfected that skill over decades and decades liberates her and JR to follow a rambling path, knowing that, whatever they find along the way, there will be a story in it. This is not just an approach to documentary filmmaking that Faces Places pulls off with breathless aplomb. It is also of a thematic piece with the film’s journey. Faces Places is very much about opening yourself up to new and unexpected experiences at any age. One of the joys of the film is seeing the vibrant, curious spirits of the subjects they meet. One factory worker stares quizzically at JR’s latest massive photograph. 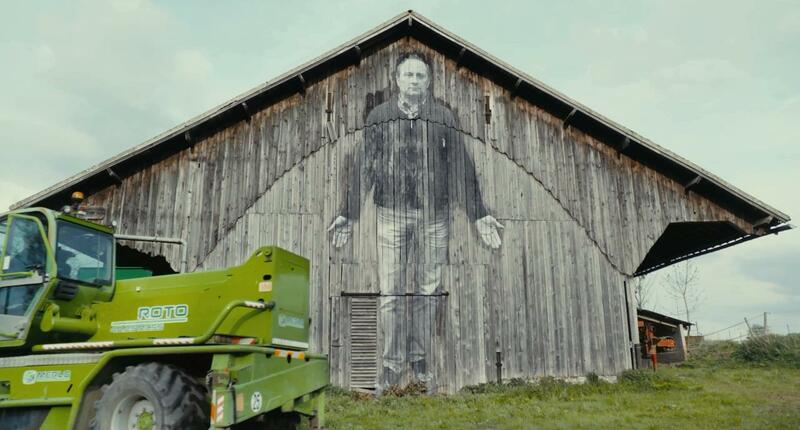 Then he beams and says, “Art is supposed to surprise us, right?” In another small town, they befriend a local farmer who has been in charge of doing his village’s harvesting for many years. Recently, the tractors he uses have had advanced computer technology installed in them. He admits that this makes him something like a passenger in his own job. He reflects that all this technology may be making use more antisocial, less engaged, But still, his overall attitude is one of wonder at progress; at life’s relentless forward motion. He is fascinated by the foreign and new. “I get a kick out of it,” he says with a smile. Faces Places has a hunger for new sights, new places, and new experiences, but it is even more vitally about opening your mind and soul to other human beings. The film hums with a spirit of adventure and with a yearning to meet, know and love the countless faces that make up our world. It is about the small joys of reaching out and connecting with people and that love for engaging with new people extends to its very creation. Faces Places is simply one of the most lovely odes I have seen to the virtues of collaborating. Varda confesses at the start that this will be her first time really working with a collaborator in over sixty years as a filmmaker. She smiles and enthusiastically notes that this will be a giant leap forward for her. 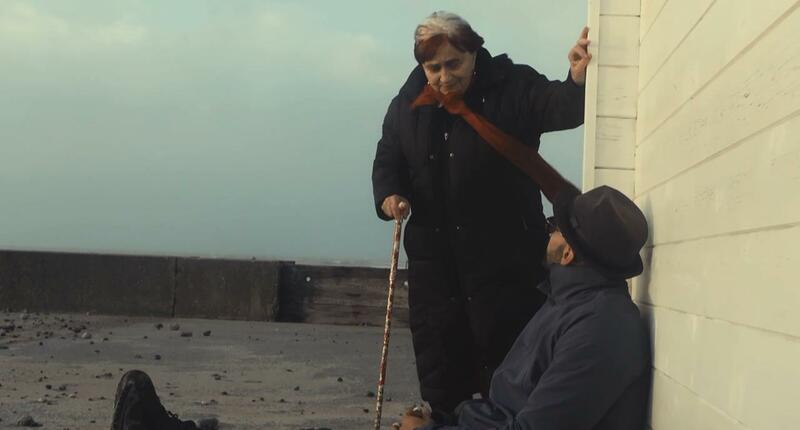 Faces Places gracefully unfolds as not only a film about its humble, hardworking subjects, but also a film about the wonderfully sweet, supportive partnership and friendship that develops between the sage, droll Varda and her spry, affably energetic traveling companion. Varda and JR are kindred spirits and also fascinatingly subtle contrasts to one another. In one scene, the two artists admit that each of them may be performing the roles their different ages have assigned to them: JR, in his sharp fedora and Roy Orbison shades, playing the spirited young man, while the diminutive, elderly Varda adopts the persona of the wise grandmother. JR’s playful presence provides a lovely complement to Varda’s more subdued brand of vivacity, though both brim with a glee for their art; for the process of finding and uncovering human beings. 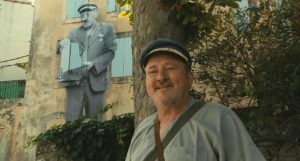 Faces Places is a celebration of collaboration as a process that both synthesizes the visions of multiple creators and also throws their unique differences into relief. It is endlessly joyful watching Varda and JR laugh, bounce ideas, and good-naturedly spar with each other, partly because the film has keen insights about the creative process. But what really makes their collaboration so engaging to watch comes down to the fact that Agnes Varda and JR are simply two of the warmest, most endearing figures to ever stroll across a film screen. They are generous, intelligent, spontaneous, and fun to be around, and they add immeasurably to this teeming, open-hearted tapestry of the very best in humankind. 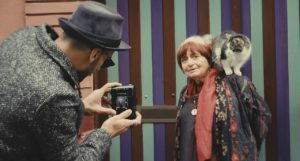 At its core, Faces Places is about wanting to know people and see them with as much kindness, clarity, and insight as we can. This is the reason the two collaborators head out into the villages of France with little plan in place outside of simply finding people and photographing them. They trust that the desire to just look at humanity will be enough to see the project through, and their faith is more than rewarded. I adore every, warm, kind interaction in this film. However, what transforms Faces Places into a masterpiece of boundless compassion and curiosity is how it slowly evolves into the story of Varda and JR wanting to better know each other. The film’s spirit of vibrant empathy is so contagious that the creators cannot help but turn their cameras upon one another. They join the arc of this ever-developing story, or rather were always a part of it. And I will now need to tread lightly, as I do not want to give away the most poignant, soul-sating, and all around best ending in any 2017 film. One of the documentary’s recurring storylines involves Agnes Varda’s longtime relationship to French New Wave master, firebrand, and petulant genius Jean Luc Godard, a now-distant friend who Agnes has not seen in over five years. With his sophisticated air of cool and the sunglasses he keeps perpetually over his eyes, Agnes sees something of Godard’s enigmatic, confident flair in JR, for better and maybe also for worse. Varda reveres her estranged friend’s talent, but also knows that Godard had a knack for being cutting, aloof, and cruel. 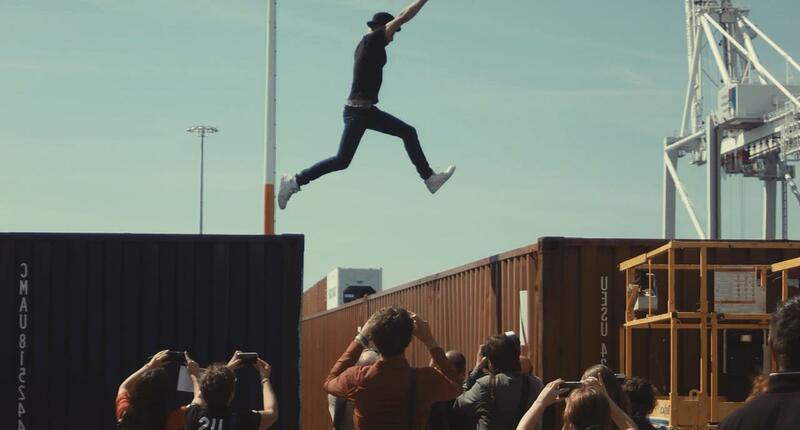 In trying to figure out who JR is as a young man just beginning to make his artistic mark on the world, Agnes Varda is also trying to parse what kind of people a new generation of artists will be. They have the shoulders of giants to stand upon, but I believe Varda also hopes for something a bit kinder than certain geniuses of her generation. I think she hopes that that a man like JR will aspire to Godard’s greatness as an artist, but also aspire to be a better all-around human being. In its final moments, Faces Places reveals itself as an effortlessly wise look at aging and legacy and an almost impossibly profound letter of hope passed down from one generation to the next one in line. In a year that seem pockmarked with generational infighting, watching the friendship and artistic kinship that flowers between Agnes Varda and JR over this brief, magical 94 minutes felt absolutely restorative. 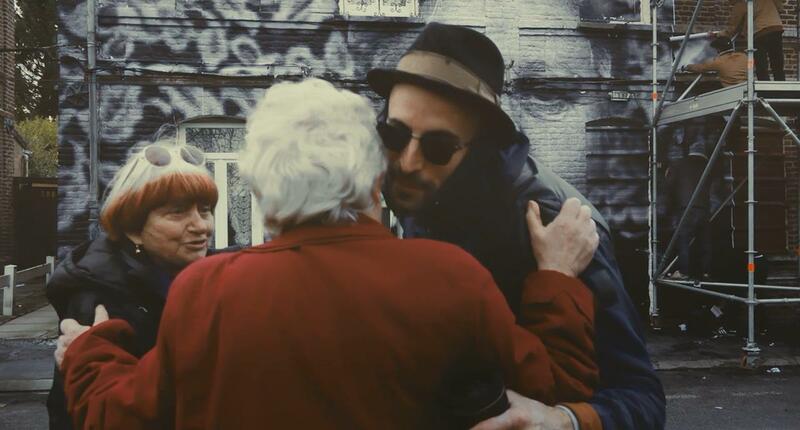 2017 had its share of powerful endings, but the closing minute of Faces Places is the one I want to keep with me; the one I want to intermittently steal away to and dwell in. It is a warm embrace between the young and the old, a tender paying of respect to experience, and a sweet expression of confidence and hope for those who will decide what humanity becomes next. Faces Places is a movie about trying to see and understand people and it ends with an exchange of mutual understanding that is too wise and beautiful for words. At the end of 2017’s storm, that final shot is an oasis of selfless calm and fellowship that I could have sat in contentedly for hours. Faces Places is a film with a vibe both heady and free-wheeling. 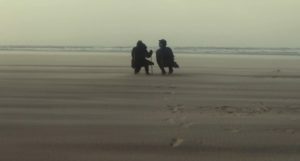 In many ways it seems like a niche film on paper, being both a subtitled documentary and a reflective essay on variousvcerebral subjects, ranging from cinema to the nature of memory to the psychic weight of place. I suppose it qualifies as an art film, but the pretentious connotations that sometimes go with that label could not be further from this film’s crystal clear aims. 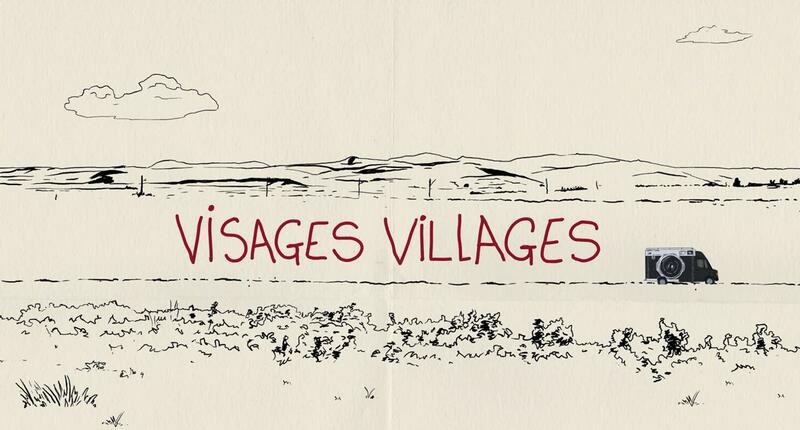 I would recommend Agnes Varda and JR’s miraculous documentary to absolutely anyone because it is so thoroughly vivacious, loving, and open. It is filled with beautiful imagery, lovely art, gracious people, and only the purest of emotions. It is funny and friendly and comforting and wistful. And, for all its philosophical musings, it finally just amounts to an open-hearted salute to the very best in people. Because its creators embark upon their journey with such earnest curiosity, playfulness, and kindness toward those around them, they find a country full of people with good hearts and stories just waiting to be unearthed. Faces Places has a lot to say, but one lesson might be that if you go out in search of the good in human beings, you are certain to find it. In one scene, Varda and JR are looking for a parasol to use for their latest photograph. 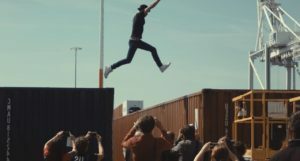 One man they question seems uncertain and a bit hassled by the request, but he obligingly runs off to his parents’ home to see what he can find. He comes back moments later beaming from ear to ear and holding his mother’s old bridal parasol. He proclaims with a proud smile, “You may use it for the photo.” A couple scenes later, he is excitedly pulling JR up to the top of the town’s tower to show off his skills as the village bell-ringer, gushing about how each bell has its own name. My mother always told me that, deep down, people want to be of help to one another and that they want to have their stories heard. You have only to extend a warm hand to them. Faces Places is 2017’s great reminder of this beautiful truth. It is as true in documentary filmmaking as it is in life: kindness and a spirit of gentle curiosity can open worlds before your very eyes. Popularity is not a huge concern for me where film is concerned. I try not to get overly invested in how widely seen or heard the art I like gets. A great many of the albums I cherish most will probably never go platinum and many of the films I count among the best are lucky to get anywhere near $50 million at the box office. One of my favorite recent Best Picture winners is The Hurt Locker, which, even after everyone knew it was going to win the Oscar, managed to scratch out just over $17 million in the United States. Popularity and approval are fickle mistresses and it’s best for your sanity not to let them get in your head too much. That is not to say I am a contrarian about popular art. I like, value, and adore plenty of widely successful works of film and music, but I also have long divorced myself of the need to have my tastes validated through massive mainstream acceptance. Still, I have to say the occasional chance to love something in tandem with a huge group of people is really, really nice. There’s an indescribably giddy thrill when you watch a brilliant piece of art skyrocket into the zeitgeist. When you hear a great film’s name floating through the air at coffee shops and house parties. I imagine it’s how it must have felt to be a Beatles fan in the 60s or a Michael Jackson fan in the 80s. Or to be alive in 1972 and watch The Godfather become the year’s box office juggernaut. It’s a special feeling when a bold, beautiful piece of art not only hauls in a boatload of money, but also just gets a wide swath of the culture talking about it. And again, one never knows when that will happen with the things they love and you can drive yourself crazy if you wait for it too expectantly. It’s probably best to love whatever moves you and not put too much stock in popularity. I only mention it for two reasons. One, because it’s been incredibly gratifying and great to watch a new horror masterwork like Get Out deservedly capture America’s hearts, minds, and fear sensors. And, secondly, because every viewing I have of it ends with me gushing that of course this became a popular phenomenon and bloody well deserves to be! Get Out is brilliant for a whole host of reasons, but I have to marvel first and foremost at what a furiously engaging, viciously clever piece of pure pop entertainment it is. Its exquisitely canny sense of cinematic popcraft is key to why it has only improved after this third viewing, just as it was crucial to coaxing $175 million worth of American eyeballs into theaters to applaud for the year’s most explosively insightful, rousingly incendiary examination of racism in modern America. It is the reason that millions not only came to see the movie and take in its scintillatingly caustic wisdom, but gushed elatedly about the experience afterwards. Get Out is the year’s, maybe even the decade’s, great reminder of the power of brilliant popular art to get a grand conversation going; to stoke the flames of discourse on a national scale. Jordan Peele’s marvelously witty horror satire begins on the dark streets of an anonymous, affluent American suburb. A young black man walks and talks on a cellphone. He speaks to the person on the other line with trepidation about his surroundings. In what may be my single favorite line of comedic dialogue in a film filled with lacerating humor, he wonders aloud what kind of demented psyche would conceive of placing a street called Edgewood Way a half a mile away from a street called Edgewood Lane. It is an early look at the film’s hybridization of horror and white bourgeois critique. It is the tried and true horror standby of suddenly not recognizing your surroundings or realizing with dread that you just passed that same creepy tree for the third time. But this time the gnarled forest has been replaced by a quiet, wealthy, predominantly white upperclass neighborhood. As an aside, having grown up in a suburb myself, I can attest that having streets with nearly identical names pop up in different random locations is a real phenomenon, and if you were to theorize that they were so arranged to confuse the daylights out of anyone foreign to the area, I would grant that is about as sound a theory as any. This young African-American man is on his way to some dinner at one of these grand, palatial houses. He never makes it there. A white muscle car blasting old-timey 1930s music (a sly elbow to the ribs of any privileged person who has ever felt nervous hearing hip hop coming from a car on some city sidewalk) pulls up and a hulking figure in a metal mask subdues this poor, lost traveler. The masked attacker throws his unfortunate conquest into the trunk and the car drives away into the eerie, lamplit suburban darkness. There is something nefarious going on in safe suburbia and Peele, an observant horror aficionado, gives us a glimpse of it through the time-tested horror trope of meeting an early a victim before we meet our main characters. To put it another way, this young African American man (the terrific and ascendant Lakeith Stanfield) is Drew Barrymore in Scream. The film’s protagonist, and the next person to walk into this perilous patch of privilege, is Chris Washington (rising British actor Daniel Kaluuya, whose subtle, brilliant facial expressions are the movie’s secret weapon), a young black photographer living in New York City. He is four months into a romance with Rose Armitage (Girls’ Allison Williams, very good), and they are about to take a very serious step forward in their relationship. They are driving down somewhere south to a nice suburb (we understand instinctively that it is the same ominous suburb from the opening) so Chris can spend a weekend getting to know Rose’s parents for the first time. The Armitages are very well played by Bradley Whitford (The West Wing) and national treasure Catherine Keener (Being John Malkovich, Capote, Into the Wild). As Rose drives, Chris talks on the phone to his best friend Rod (Lil Rel Howery, giving occasional, utterly welcome bursts of broad comedy to an unsettling film), an animated, slightly paranoid TSA agent who warns him that the white suburbs can be a strange and scary place. A moment later, a terrified deer hurtles across the road and leaps through the window of the moving car. It’s a tense moment made even more tense by the arrival of a pushy police officer, who prods Chris for his identification even though he had not been driving. The two lovers eventually make it to the Armitage homestead, a large, gorgeous mansion with a gazebo, a lake, and a sprawling backyard fit for strolling and lawn sports. The Armitage parents seem to be nice enough people with an awkwardly liberal sensibility. Mr. Armitage gushes to Chris that he would have voted Obama for a third term and he blushes when Chris sees that the family keeps two black servants on the property. They are soon joined by Rose’s cocky smart-aleck brother, Jeremy (Caleb Landry Jones in a polarizing performance that I actually find perfectly tuned to the arrogant, entitled archetype it is going for). Jeremy is home on a holiday from medical school. The film is about Chris entering into a white suburban setting as essentially the only black person and it keenly shows what a stressful process that is for him to navigate. We feel a subtle sense of unease for Chris even before Mrs. Armitage is cajoling him into an already iconic midnight hypnotism session to cure him of his smoking, before Chris starts noticing that the black housekeeper and groundskeeper have an air of polite, lobotomized menace about them, and before a throng of wealthy Caucasian partygoers descend upon the house to attend the Armitages’ annual garden soiree and to pepper Chris with wrongheaded displays of racial sensitivity and questions about the advantages of blackness. Get Out is a horror film at its core, in ways that I prefer not to spoil, but it is also a brilliantly pitched satire of the general anxiety of being black in America and in largely white spaces, to whatever extent the two are even different. Before we come to understand the sinister mysteries lurking beneath this civil, liberal façade, Get Out is an outstanding deconstruction of the façade itself. It is amazingly perceptive about the quieter, less overt kinds of racism and fear that Chris has to deal with as a matter of daily black life. If Get Out had never transitioned into a literal horror film, it would still probably stand as one of the most insightful and stinging examinations ever made about the intersection between racism and well-meaning white progressivism. Get Out is great as both a perfectly paced horror film and as a shrewd, biting comedy of manners, but it is most ingenious of all in how it blends the two approaches to create something new, lively, and startling. Jordan Peele has famously bristled at the suggestion that his film could ever be classified as a comedy. Peele may have risen to prominence as one half of the acclaimed Key and Peele comedy duo, but he has been unequivocal about having only the most sober motives for making Get Out. “Get Out is a documentary,” he announced on Twitter. I may disagree with Jordan Peele’s argument that Get Out is not a comedy, but his point is very well taken and I am in total agreement with the spirit of what he is saying. Get Out is smart and very funny, but it does not exist to be anyone’s source of levity. 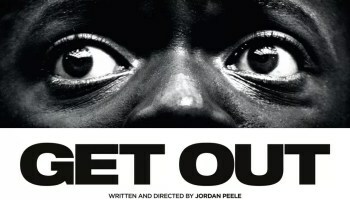 It is a film that speaks its truths with clear wisdom and authority and Peele’s nimble comedic timing, which is present even in some of the film’s most terrifying moments, should not undercut the fact that the film is speaking honestly about a very real state of injustice in modern America. But Get Out is a fantastic reminder that comedy can be used to enhance serious themes rather than detract from them. What makes Get Out such a blisteringly great piece of work is that it reminds us of comedy’s power to speak with fury and unflinching candor. Not every work of comedy exists simply to produce laughter. Dr. Strangelove (Or How I Learned To Stop Worrying and Love the Bomb) is one of the most perfect comedies ever created and it is not the least bit frivolous. It has arsenic in its veins and its purpose is to bluntly tell us that we will one day annihilate ourselves with nuclear weapons. But the bigger issue here seems to be Peele’s fear that comedy gets unfairly dismissed in today’s culture, and that suspicion could scarcely be more well-founded . Get Out’s script contains some of the sharpest comedic insights to be written in years, but it is a work of genius because it has more on its mind that any single genre can encompass. Peele has created an impeccably paced hybrid of horror, thriller, satire, social critique, and comedy because he needed all those colors to evoke the full picture of what racism looks like in the 21st century. And what is most gob-smacking is not only that this hybrid of styles hits its targets with pinpoint precision, but that the finished result is so completely captivating and compulsively watchable. For a film taking on at least three different genres at once, Get Out simply moves like a dream. Jordan Peele has made a blazingly original, energetic blockbuster entertainment for America to laugh at, scream through, and excitedly talk about. And I stand in defense of his freedom to question how that work is processed and classified. He has made a film that captures American race relations in a way few ever have, and he has earned the right to call all of us out for finding any of it simply funny or entertaining. Get Out announces itself as a horror thriller in its opening minute, when a young man is put in a violent chokehold and thrown unconscious into the back of a strange car. It is a dread-soaked, pulse-pounding, menacing piece of work right until it plays its heart-stoppingly suspenseful final card. For all its genre-bending, it is indisputably a work of horror cinema, yet I have heard the odd viewer express disappointment about where the film ends up in its most explicitly horror-bound third act. I personally think that the film’s journey from subtle social satire through nervy, unsettling comedy of manners and into the realm of the nightmarish is a big part of the film’s brilliance. But the very fact of that complaint points to just how cannily Get Out works as an incisive dissection of white gentility. Get Out is a brilliant whole composed of individually brilliant parts. The early scenes introducing the Armitages have a strong grasp of the banal niceties of a privileged Caucasian family that dearly wishes to be seen as racially enlightened. The little touches of affluent suburbia are trenchant and funny and just right, from the early false start menace of a runaway deer (the scourge of many a suburban street where I come from) to the awkward mandatory tour of the Armitage house, to Mr. Armitage’s desperate attempt to endear himself to his daughter’s new beau by shoehorning urban vernacular into his conversation. The Armitage cocktail party, like the Armitages themselves, is a cavalcade of cringeworthy rich progressive tics, from the retired golfer who won’t stop gushing about Tiger Woods to the man who tells Chris without blinking how very fashionable black culture has become. These scenes are not horrifying in the conventional sense, but Daniel Kaluuya’s precise, beautifully reactive performance captures the agonizing discomfort of having to be the one black person in this situation. The scenes of Chris simply trying to survive an awkward weekend with a self-consciously liberal white family, their aggravatingly oblivious friends, and their unnervingly sedated African-American servants add up some of the most splendidly written, well-acted, and insightful satire I have seen in a long time. This is a world of gazeboes and bingo, of hired help and carrot cakes. Of badminton and leisurely days spent drinking pitchers of lemonade on the back patio. It is unsurprising that bocce balls, fine china teacups, and mounted hunting trophies are fixtures of this place. The twist is to present this mannered, civil milieu as something foreboding and unhinged and to have those symbols of luxury become props in a frantic struggle for survival. Peele paints his vision of upper class suburban life in such a sublimely acerbic way that I do not blame anyone for wanting a whole film of it. But having that space, which feels so benign to those who dwell in it, morph into a hellscape is the point. To Chris and other black men like him, a rich, predominantly white space like this always has the potential to become dangerous. For black Americans, the suburbs have always vibrated with the barely hidden threat of violence and suppression. Get Out cannot simply be a satire or a social critique of liberal privilege for the same reason it cannot simply be a comedy. It was never meant to be about that. Horror was always deep within its DNA. The film draws us in to laughing and nodding in knowing agreement at its witty social points, but the film is really about coming to understand Chris. In fact, it is not even to correct to say it is about understanding him. Peele’s faultless writing and Kaluuya’s rich, focused performance make Chris Washington an understandable, relatable, and endlessly sympathetic character from the very outset. There is never a question that we will understand and like this man. 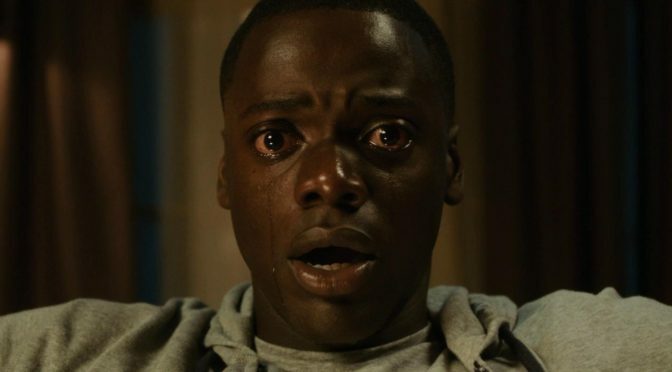 The reason Get Out must descend into full-scale horror, into the inky suffocation of the Sunken Place, is that we must learn to feel Chris’ alert state of terror. We must be with him through this ordeal so that his horror, from the smaller social anxieties to the larger fear of death, becomes our own in some way. Jordan Peele is saying in no uncertain terms that this is what the black experience in America has felt like, feels like, and will likely continue to feel like for the foreseeable future. It is the simmering tension of feeling at best out of place, and forever looking over your shoulder for an even less innocuous source of dread. It is why it is not only really nice, but also just plain important that Get Out has become the year’s most perfectly engrossing piece of popular entertainment. Its pop bonafides ensure that its massive audience is hooked in and along for the ride, and from that point all Peele has to do is train his camera on Chris for the duration. Get Out torpedoes the typical big shows of racial tolerance. Peele throws these ineffectual gestures back at his country and instead asks that we just think more about what it is like to be in Chris’ shoes. It is a call for less impotent guilt, less useless self-pity, and more empathy. To the white crowds that saw and cheered for it, Get Out was an invitation to empathize in a truly clear-eyed way. And to the millions of black Americans who watched it, it was a gratifying opportunity to have a grand mainstream phenomenon capture bits of their experiences and project them onto the screens of a nation that rarely hears them. It was a chance to go into a horror film, a genre that historically chews up black characters, and see something different. Without saying if Chris survives his journey through the seven circles of suburbia, one thing is beyond doubt: Chris is a vibrant, nuanced, unforgettable character, and Get Out is fully his story. This horror film may put him through some mortifying paces, but it also respects him and is entirely about him. It belongs to him. There are any number of great films to come out each year, and only a fraction of them get the wide attention they deserve. That is just a fact of life in our current cinema culture, which offers a staggering array of potential titles to watch each and every week of the year. Popularity does not give a work of art its greatness, but certain works of art demand to be seen by as many people as possible. If any film this year were to pull in a massive audience, I am glad that Get Out is that film. That is not simply because it is witty and cutting and wonderful. It is not even because of how valuable and poignant its message is. More than anything it is because Get Out says more to me about the American experience than any other film this year did. It deserves to be a national box office hit because it is a film about our nation. It deserves to be popular because it is about our population. It is about how it feels to be a black person in the current national climate. It is about the current black struggle and about how the privileged Americans on the sidelines of that struggle attempt to understand it, lend support to it, misguidedly define it, and exploit it. It is about the varying ways that white Americans try, and often fail, to help; to reduce some of the dread that comes with being black in this country. It is about the teeming, conflicting mass of racism, compassion, apathy, idealism, and ignorance that is America. It is a critique of the failings of those of who meekly claim to want to do some good; of those who insist that they stand for tolerance and personhood but can offer little outside of empty assurances. It satirizes our varying, feeble responses to this ongoing saga of dread. It pokes fun at the many layers of our rhetoric and our guilt. It allows us to laugh at the absurdity of our manners and mores. But it eventually stands back aghast. Because for as many of us decry bigotry, America continues to be a pretty frightening place to not be white. Even with all our niceties and best intentions accounted for, the end result still looks an awful lot like horror.